You must make reservations at least 5 minutes in advance of the time at Solterra Winery and Kitchen. Ample parking across the street along with 14 spaces behind the building along with parking behind the building just to the north of us. We have many types of events including Wine Club parties, movie nights, and Prix Fixe dinners. Solterra offers delicious mediterranean style tapas and entrees that pair well with the wines that we produce. We crush about 70 tons of grapes every harvest on premise and have and diners on the weekends can dine amongst the barrels. We source grapes from Sonoma county, Lake County, Paso Robles, San Diego County, and Baja Mexico. The wines have garnered Golds and 6 Best of Class awards at top competitions . 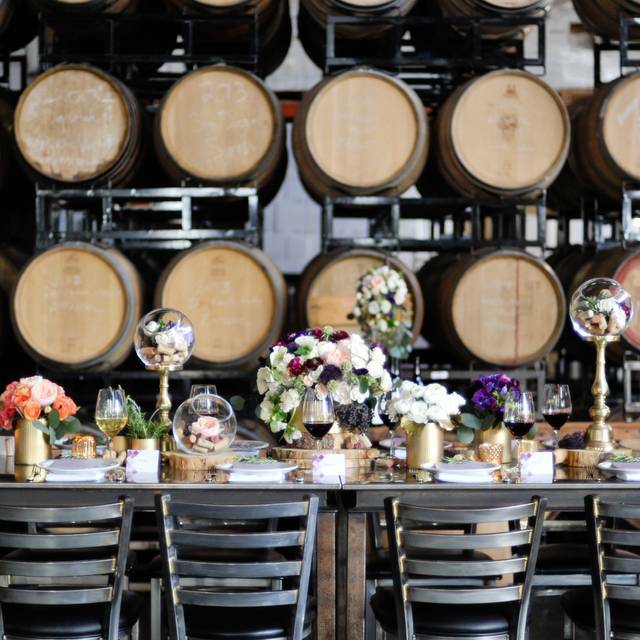 We can accommodate large private events in our Barrel Room, Bocce Ball court, and Main Room. For Inquires please email events@solterrawinery.com. We look forward to your visit. Cheers! Amazing staff and great food!! Relaxing venue, great food, top chef, talented musicians on weekends, warm staff. We have had date nights, special occasions, friend’s get togethers and every day dining at Solterra and it’s always a treat. It’s intimate with wonderful service, delicious wine and food. We joined their wine club and it’s a favorite place that we love to go and always a great value if you love great wine and great food! We love Solterra- great vibe, amazing wine and delicious food with great presentation. The worst service I have ever had at a restaurant. My friends and I decided on Solterra for a girls get together weekend. We made a reservation and when we arrived for our reserved timeslot we were told that the kitchen was backed up. They did offer to give our party of 11 each a glass of wine along with bread and olives but by the time we were seated about 45 minutes after our reservation was booked for, and we were told that we would not be able to put our dinner orders in for over an hour because the kitchen was backed up. Ultimately we decided to leave because we were a group of 11 very hungry women But still, I have never been forced to leave a restaurant due to their lack of addition sees and kitchen support for Saturday night. Read the reviews for this restaurant, they are 100% accurate. This restaurant is not ready to be in business beyond making or serving wine. Underwhelmed. We had been looking forward to this place but found everything to be slightly less than what we would have hoped. They have all the elements of a great place, but it’s clear they still have some work to do. Great food, fun atmosphere and fabulous wine! Perfect for a Sunday afternoon lunch on a bright sunny day. We love Solterra! Great ambiance, super tasty food, fabulous wine and friendly wait staff! We highly recommend! it is the epitome of Leucadia/Encinitas - fabulous and low-key, super cool people! Service, food, wine, music, and ambiance were all outstanding. We loved our waiter. Menu lacks variety and is quite overpriced for what is served. The food took an inordinately long time and the chicken arrived raw at the bone. The coffee, a french press, was lukewarm but the best value. A beautiful space though. Brett Pierce provided excellent service! Food and wine were exceptional. Fun crowd of friendly people. Amazing service. Great food and presentation. Wine made on site. We had high hopes for Solterra. My wife was there the week before, and was very pleased. We arrived and the place was not busy. We were seated at a nice, quiet table. So far, so good. The wine was good, the salad was very good. The anticipated octopus was NOT good. Very chewy. not hot. not delectable. It was sent back. The cauliflower arrived almost raw. We thought it was supposed to be roasted? That was sent back and replaced with more tender, edible cauliflower. The fish arrived and was fine, although not hot! Anyway, not a wonderful experience. the octopus was removed from the bill. thankfully. Unfortunately, that was the draw for us. We love octopus. and were looking forward to the other items prepared, appropriately. always a pleasure, the staff, the wine, the food and friends equals a great evening! Love love love the wine at this place! We are members so we go frequently. The wine is outstanding! Prices on the charcuterie trays could be a little better or there could be more on the plate for the cost. We really do enjoy going here! I’m glad we returned to Solterra. We’ve had very hit and miss meals and we were reluctant to try it again. Menu is really limited, and we have struggled in the past. Further, inexplicably, the white wine options in the past have been really meager. I’m happy to say that the wine selection was delicious. The service was fantastic. The meal was a pleasant surprise. We enjoyed ourselves so much that I recommended that my husband and I go again this week. I hope we are not disappointed! Interesting wine list, good food menu and relaxing atmosphere. Amazing atmosphere, wine and food! Such a great, fun find. Great for tow people or a big group. Food was delectable. Best Brussels sprouts ever. The wine was delicious, so we tried a few different bottles. The barrels smell so good. The service was definitely off tonight. My husband and I and our two teenage daughters came here for dinner on a Sunday evening in winter during a holiday weekend to celebrate my birthday. Where we were seated, a cold draft was hitting me from where the garage-door closure didn't meet the wall. We found the menu limited and pricy. My daughter ordered the duck wings tapa as her main course, and about 20 minutes after we ordered, our waiter came over and said they were out of duck wings, did she want to order something else? After decided on the octopus tapa, we waited another 10-15 minutes for our food. Three of our dinners arrived, but not my daughter's octopus, which the server assured us would be right out. We waited another 10 minutes, during which time our waiter noticed we were still missing the octopus and said he was just going to bring it out. It took another five minutes for that to happen, as the rest of our dinners got cold. He apologized for the wait. The food was OK, nothing special. We looked over the dessert menu and decided to skip it. Our waiter didn't offer to bring us dessert on the house. I doubt we'll be back. Fresh tasty wine, nice customer service, hostess was fantastic and so was the server. Delicious artfully prepared charcuterrie. Have been going to Solterra since it opened...used to go 3-4 times per month...but the quality of the food is not what it used to be and the prices are steep for what you get. Case in point...ordered Lobster Paella the other night. The dish was not Paella but simply cooked rice with chorizo and topped with seafood. The piece of lobster was ridiculously small, the two scallops while nice in size were not hot and had no flavor...they would have been better if seared. We have ordered the Paella many many times in the past and it has often been served at their pick-up parties, but this was very very disappointing because it was NOT Paella, but rice topped with seafood! The waiter told us it would have a crunchy bottom...which it did not...but was sitting on some type of a tangy sauce instead! This place is amazing. It just keeps getting better and better. A hidden gem of north county San Diego! this was our first time at solterra winery and kitchen. we took out of town guests there and will bring other out of town guests there in the future. our waitress, gabby, was exceptional and made sure we were well taken care of. she helped pick out the wine, which was excellent. the presentaion of the food was wonderful and tasted very good. the cook is very talented. we live down the road from solterra and will make this one of our stopping places for wine. Nick was fabulous as was the Merlot. I would’ve preferred more choices on the menu but we managed to find something that worked for us. I wish I would have had time to get information on the wine club. Everything was grest except the lamb burgers one was raw in the middle two had bones, gristle and was tough. Server said changed vendor I highly recommend finding a better vendor. We had another nice nite at Solterra Winery. This time we had the Brussels sprouts (Very good) and cheese plate (so good I had to resist more). For dinner we had the Lamb Burger (VG) (That’s very good not Vegan)) and the Oyster dish with a white sauce (also VG). This review may be biased as we are wine club members. My sister was visiting from Chicago and we decide to go for dinner. It was great, the service was beyond wonderful and food and wine were delicious! Definitely will go back! My husband and I came here to enjoy our Friday evening. We ordered 2 glasses of wine each, the meat and cheese plate and the lamb stew (which was out of this world delish!) And the total bill was under 100.00! The bartender was amazing. Really nice and knowledgeable. He also proposed tastes of wine that he thought we might enjoy more than our first selection. I enjoyed the ambiance and the interactions with the other people at the bar. Definitely coming back! Great ambience, great food, and great service make this the perfect date spot! Will be back soon. Prefix for New Year’s Eve. The worst food we have had in a long while. Paella was just sticky rice and a few clams and mussels. Everything else looked and tasted like it had been setting around for hours.Only the flatbread was edible. We all went home hungry. Live music stopped right as we arrived for our reservation at 9 and there was no other decorations or New Years festivities. Dessert was not included in this menu so adding a single glass of wine and tip this meal topped out at almost $80 per person. Definitely a misrepresented and poorly executed New Years event and a complete waste of money. Went for the NY Eve prix fixe meal. All items were delicious EXCEPT the paella, which was very "gummy". i.e. the rice was glommed together and not "grain separate" as usually prepared. We arrived a few minutes early so our table was not ready and we sat at the bar, where we decided to stay (our hostess was fine with this). All and all a fun evening....festive, celebratory, staff attentive, interesting conversations with our fellow bar guests. We had a great time. Their wine on tap was excellent. Really enjoyed the Pinot and Syrah! Our server Corbin was really great as well. The menu is limited, but the food is excellent. 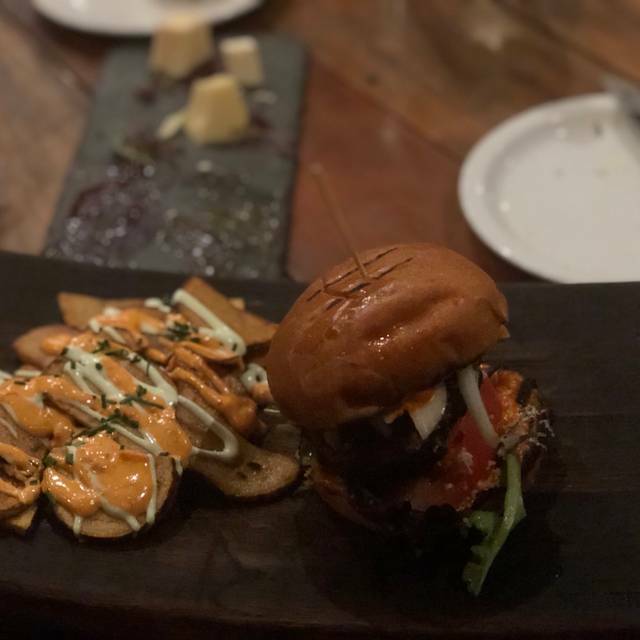 Had the cheese plate with our wine and the lamb burger was excellent with the patatas bravas! Food was good, but the service is always hit or miss. Solterra is one of my favorite restaurants in North County based on their consistent focus on excellence - food, wine, service and ambiance. I love that their menu continues to be inventive and evolving, and I truly appreciate that the entire dining experience is 5 stars. What is not to like about Solterra? Good food, great wine, friendly staff and a chance to enjoy in a working winery! No place like it in Southern California. We have visited before and were happy to see the lamb burger and patatas bravas are back on the menu. Always our favorite. The staff is very friendly, great help with wine selection to match our food. They make it fun and know the wines well since they are made on site. We enjoyed the merlot and petite sirah. Both award winners for us. Can't wait for our next visit, which will be soon! We dined here 6-9 months ago and food was delicious. We returned for some paella. There's a new cheap looking menu and no paella. Most of the month watering dishes were gone too. Patatas were bland and not even similar to the ones you get in Spain. My friend ordered the $36 cod fish that came with a ridiculously small piece of fish. The $38 NY strip was chewy and fatty. Don't waste your time and money here. We won't be going back.